A system is only as strong as its weakest link, and in an off road winch system, the cable is that weakest link. Read on to see our picks for the best alternatives to winch cable so you won’t get stuck in the mud. Let’s face it, what good is a 10,000 pound winch when your cable snaps? It may seem expensive, but upgrading from inferior steel cable to synthetic winch rope is one of the smartest ways you can improve your off roading. Synthetic line is superior to steel cable for several reasons. First, synthetic is much safer. Steel cable stores energy when it is wound up. When that cable finally breaks, it becomes a steel whip that is capable of doing serious damage to a person or your precious off road vehicle. Synthetic rope on the other hand, does not store energy when wound up. So under the extreme case that the rope fails, it is not going to hurt you. Second, it is more reliable. Steel cable is susceptible to weather damage, kinks, and corrosion. All of these factors can reduce the integrity of the cable. On top of this, steel cable is not as strong per pound as the synthetic alternatives. Lastly, it weighs less. synthetic line is anywhere up to a tenth of the weight of steel cable. This offers significant weight savings, but also makes it easier to handle. Click the buttons above for detailed information about each unit, or read on for our review of each of the top 3 synthetic winch ropes. Our top choice for the best rope in this review is the WARN 87915 Spydura . 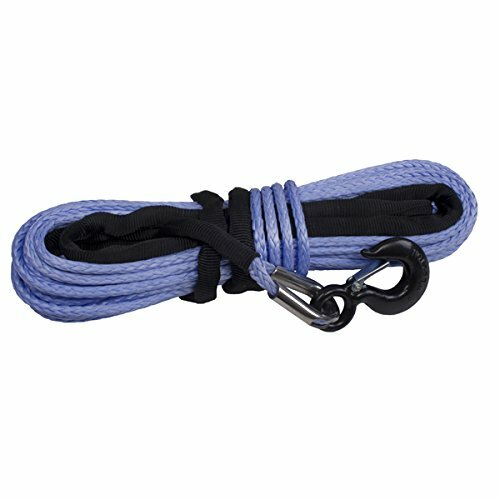 This synthetic winch rope made the top of our list because of the great quality, durability, cost per foot, and product tester reviews. The WARN synthetic rope is several times lighter than cable, and better in several other ways. The Spydura rope is somewhat legendary for its quality and durability, although it will cost you. A 100 foot length of this rope can cost you just as much if not more than the winch itself. This rope is made out of polyethylene, which makes it more resistant to abrasion, increasing the lifespan of the rope, as well as increasing the strength over lesser rope materials. The rope is 3/8 inches thick, which is very thin for how strong it is. The rope is rated for use on 10,000 pounds or less. This package comes with a ballistic nylon sleeve, which protects the rope even further. The sleeve is temperature resistant for high friction moments. Also included with this rope is the self-tightening rope attachment, which allows you to use the full length of the winch rope. Lastly, a reinforced hook and hook strap are included. The WARN Spydura Synthetic winch rope has received exceedingly good reviews, achieving more 4 and 5 star reviews than any other rope on the market. People who bought the product said things like “I am very pleased with the purchase” and “Can’t beat WARN quality.” The only negative thing people had to say was about the price. 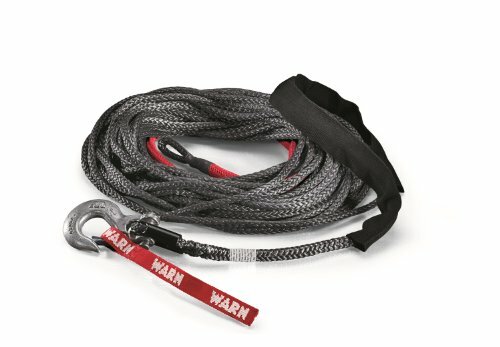 Not only is the WARN Spydura the best synthetic winch rope for sale, it can also can be aquired for less than other options. 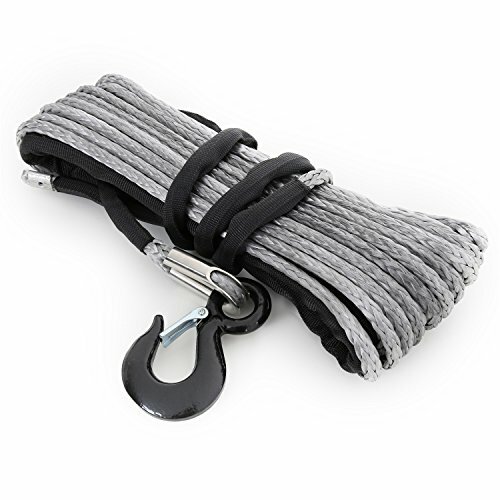 The 2nd best option in our roundup of synthetic winch rope is the Smittybilt 97712. Smittybilt is one of the best manufacturers when it comes to winches, so why wouldn’t the same be true when it comes to synthetic winch rope? The Smittybilt 97495 XRC Winch came out on top as our pick for the best winch for the money, and this is the perfect rope to go with it. The Smittybilt synthetic winch rope boasts an ultra low weight, weighing in at 1/7th the weight of regular steel winch cable. But the low weight does not mean that the rope can’t pull a big load. In fact, it is the strongest rope to make our list at 12,000 pounds pulling weight. 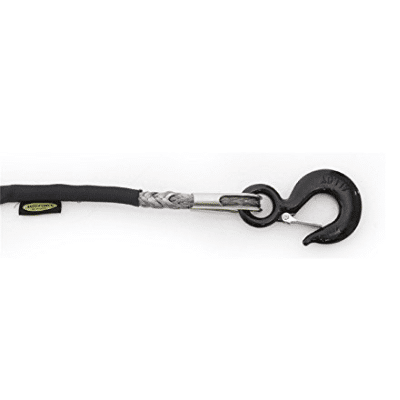 This 12,000 lb synthetic winch rope is treated to be UV and abrasive resistant, so you don’t have to worry about your investment being damaged in the sun. 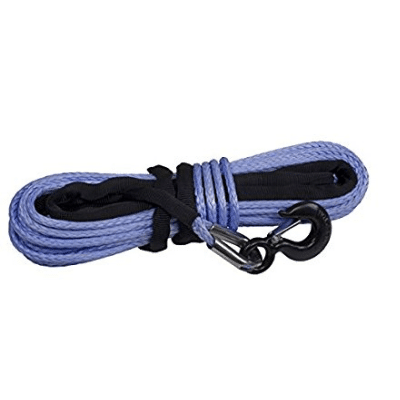 This rope has garnered great reviews, with customers remarking that it is easy to install. Overall, the Smittybilt 97712 rope is an excellent choice for synthetic winch rope, all though it costs slightly more per foot than the other options. The final item in our review of synthetic winch rope is the Rugged Ridge 15102.10. This rope is the most affordable option that made this list list, but that by does not mean this isn’t a great rope. If you spent most of your cash on your winch and don’t have much left to spend on winch cable, this is the one for you. 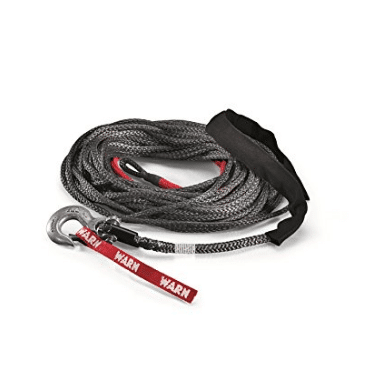 Although not as strong as the other ropes in this review, the Rugged Ridge rope is still very capable at 8,000 pounds pull limit. The rope is made of UV treated kevlar, meaning an unmatched weight to strength ratio and lasting durability. Also included with this package is a protective sleeve, latched hook, and stainless steel thimble. Although this rope is not as highly rated as the other two, product testers still had good things to say about it. Some of the comments were things like “great line”, “easy to install”, and “well worth the money”. Overall, this is a decent rope that will get the job done, and the great cost per foot makes it even more attractive. Below is some information that you may find useful when considering which rope to buy, as well as some maintenance tips for after you purchase. When considering what type of winch line to get, you should consider what type of vehicle you will be using it on, as it will greatly impact your needs. When purchasing cable for an ATV, you can go for a lower max weight, as the vehicle you will be pulling will weigh less. Also, you may want to consider getting a shorter rope, as you may not have as much space for it on the spool. Take these same considerations and apply them to UTVs and trucks, keeping in mind that they weigh more. For trucks and heavier vehicles you will want the strongest rope you can get, as well as the longest length possible to prevent you from getting stuck. Proper maintenance will help protect your investment in your rope, and reduce the chances of rope failure. 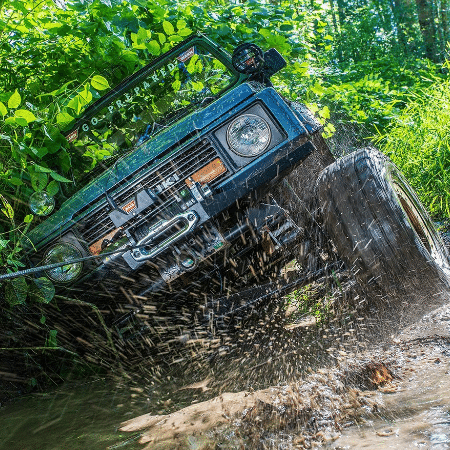 Be sure to follow these tips every time you deal with winch cable. First, make sure that when you set up the line in the first place, there is no friction against abrasive surfaces on your vehicle. The line should be pulled tight and neatly wrapped around the spool. Bunching up on the winch will cause unnecessary friction and will prematurely wear out your rope. Second, when the line is in use make sure that the cable is not rubbing against any abrasive surfaces. If your cable has to be in contact with a sharp object like a rock, make sure to use a chafe guard to prevent damage to your line. Third, inspect you rope frequently. The more you check your line, the more likely you are to find snags or tears before they become a major problem. It is optimal to check your cable after every time you use it. If damage to the rope is found, repair it before using again. Fourth, clean your rope when it is dirty. Dirt, rocks, and other small particles are bound to end up inside your cable with regular use. The build up of these particles in your rope will increase friction and prematurely wear it out. To remove these objects, wash with soap and water.